City Staff are recommending the Council move forward with the plan to eliminate Left Turns from 141 and State Bridge Rd. In essence, they will be taking two left turns in every direction, consolidating them to one lane, and then stopping traffic (with new lights) to let these vehicles make a U turn and proceed straight. If two lanes of left turning traffic are not enough, how will one lane be? How will be adding 4 more traffic lights within the intersection area make the traffic flow better? Read our previous posts about this radical plan here & here. 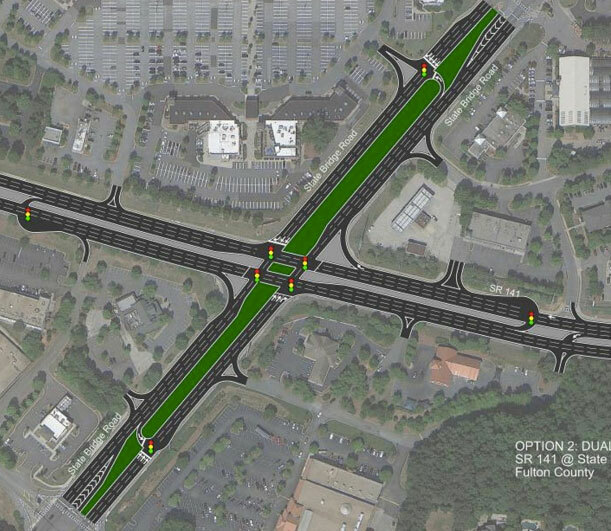 This “innovative intersection concept” will cost taxpayers $500,000 for the design fee. Citizen input will be sought AFTER this money has been invested, not before. The Mayor has NOT held a town hall to solely discuss the traffic congestion and seek Citizen input for solutions. The Mayor has held Town Halls and community meetings to discuss the “District”, a plan to redevelop Tech Park into a Urban downtown. Much of staff’s time is consumed with planning redevelopment of private property. Creating more development, will NOT solve our traffic issues. We here at the JCP would like to see the lights synchronize better. Lengthen the time of lights for more cars to go through! Let’s try that before wasting more tax dollars. What do you think will relieve congestion on 141 & State Bridge rd? What are your traffic solutions for other areas within the City? Sounds ridiculous. U-turns create accident dangers with the aggressive driving habits around here. Drivers constantly ignore the “yield to U-turn” signs at that intersection and cause near accidents daily. I agree, the lights need to be longer for the left turns which would also eliminate all the cars cutting through the shopping centers to avoid those lights and that would increase the drivers cutting through with this proposal. I appreciate any effort with a reasonable ROI to solve traffic problems. If the Michigan turn solution has been implemented, there must be an independent study of it’s effect – there are answers to this article’s questions about it’s effect. A study that validates that “x” % more vehicles are handled at peak times at current high volume intersections would put this concept on much better footing (or not, if that can’t be proved). BTW – has anyone told the gas station owner on the NW corner that his business is not in the current design? The gas station is there. This rendering from the consultant isn’t oriented correctly. It has “west” where “north” should be. They have these in New Orleans. Very confusing. The amount of traffic on 141 is too much to have these U turns. I think that it is a huge mistake. I think the traffic lights should be synchronized and a little bit longer. The u turns at that intersection will cause more accidents then before. This will cause more problems! If I want to turn left on State Bridge coming from 141 north I will have to turn right at the BP and cross 3 lanes of traffic in front of the high school to get into the U-turn lane to swing around? Am I reading this right? During school hours! This will be impossible. Yes, you reading this correctly. This plan was presented last March and City Council has been pursuing it since. The only way to solve this is to build a overpass. Redirecting traffic to another traffic light and another U-turn only create another set of problems – confusions and new area of congestion. I’d like to see the models they used for this study. Did they use bumper-to -bumper traffic as is the case during morning and afternoon commutes? Money needs to be put toward orchestrating the lights BEFORE it’s put toward this project. Fix what broken first! As for taking two turn lanes into just one and adding additional traffic to that doesn’t make sense to me either. I don’t think any study will convince me otherwise. Also, do you think that by adding lights at the UTurn areas will help anything? Drivers will block those intersections just like they do today. Maybe the study assumed that drivers follow traffic laws. Plano tried the Michigan-left… and is removed it 4 years later. The overpass solution will work FAB. We can even toll the folk that don’t live in Johns Creek (>50% of the traffic during peak period) to pay for it while letting the local citizens go toll free! Since peak-period through trips are causing the problem, this is the logical solution. I agree with the view of doing an overpass. It really should have been done long ago and it is the only right solution. If you look at that intersection, it is at the top of a hill, so you could use that to your advantage by digging down for one direction and making the over pass at the same street levels as they are today. I would really encourage JC to look very seriously at doing this right so it will last and not to get caught up in cockamamie ideas. Look at the stupid crisscross thing someone did at I85 and Bridge Road – it made matters confusing and did not solve the problem. An overpass for through traffic was needed there also. I appreciate good new ideas, that may save money, but what is being proposed at State Bridge and 141 and what was done at State Bridge and I85 are not good new ideas. If we are going to put drivers through construction at this intersection, let’s make sure it is worth the effort. Here’s a website just for thru-turns. Have a look and see if you think the traffic is the same in these implementations and here in Johns Creek. I have asked the city numerous times why we don’t utilize the right turn lanes to also travel through the intersection to increase the volume potentially up to 50%. I never get an answer. That is the simplest and fastest way to improve traffic volume immediately, with no additional asphalt needed. The same engineering company that brought this idea to Johns Creek last spring is now on tap to get 500k in a contract. As I recall we tax payers paid thousands of dollars within the past 3 years to add second turn lanes and lengthen the turn lanes to these intersections. That has improved traffic flow somewhat but the shear volume of traffic offsets this improvement. That is due to the unbridled construction of new residential neighborhoods on 141 north of McGinnis and east on McGinnis. Additional U-turns will not solve this congestion but simply result in more accidents. One over pass on 141 will not be of significant benefit if such are not constructed at the other 10 intersections on 141. BOO to this ridiculous notion!! Crazy, confusing idea! Forget it!! Try putting more cops in these areas! People are holding up traffic because of “TEXTING”!!!!! I see it constantly!! I have had to honk my horn to wake them up to look up from phone! SBR GOING OVER JOHNS CREEK BRIDGE GOING EAST, toward 141! RIDICULOUS ALREADY!!!! Doesn’t anyone want to get home????? Here’s my direct experience with Michigan U-turns (I’m from there originally). I now generally avoid traveling in these areas or only use those intersections for continuing straight through. I don’t bother with businesses that require that much extra effort to get to, which is required in areas nearby the M U-turns. Instead of waiting at just one intersection, you must now wait at three!! First is the intersection where you wanted to turn left, but now must wait at a light, before proceeding straight through. Second is the backed up new left U-turn lanes, beyond where you wanted to go. Once you do the U, now you are right back at the original intersection you wanted to turn left at. But now as you sit in a line of traffic at this third intersection, you will eventually get to make a right turn onto the street where you had originally intended to be. So yeah, hanging out at three intersections instead of one, is asinine! I’m not even taking into account the confusion caused at the U turn, which requires you to yield to other drivers, with flashing U-turn signals at off peak times. Even the two converging left U-turn driver lanes often end up honking at each other. It’s a total cluster! All this does is shift the back-up down one block, away from the original intersection, to the new U-turn lanes and cross-over. As an aside, I would no longer consider buying or renting residential property in an area if my main commute route involved needing to turn at these Michigan U-turn intesrsections! No way, no how!! It’s unfathomable that anyone would consider this as a realistic time saving solution at one of the worst intersections in our local area here. Only those with no actual M U-turn experience and those unfamiliar with this horrendous intersection in GA, would suggest otherwise! My solution: leave all the turn lanes alone in all directions. Instead, build two multi lane flyovers for continuous through traffic. One to accommodate all east/west traffic and the other to handle all through north/southbound traffic. This will likely eliminate most massive waits for those who wish to turn, and will allow the majority to proceed directly through/over, without waiting at any traffic lights! It will also encourage people to continue frequenting businesses in that imediate intersection/area, who might do otherwise if they had to approach three intersections to get to their destination. Initially expensive? I’m sure it is, however it’s probably cheaper in the long run than building M U-turns, and later abandoning them for a more realistic working solution. Combine this with tolls for non- locals, to recoup construction costs, etc. We need to invest for the long run and invest in our own community. It is ironic how the mentality for many in Georgia is less taxes and less government will fix everything. This is a result of years of negligence by intentionally under funding transportation. The JC Mayor and City Council were still upset that the gas tax was raised a mere six cents last year to raise an additional billion dollars a year to help with the back log of maintenance. They say no to everything – no to Marta, no to gas tax increase, no to adequate road funding. Time to build an overpass and elect some pro-America leaders who believe in investing in their own community, state and country. We spoke to the Public Works Director 10 months ago, when this proposal was introduced. We mentioned these concerns and suggested a flyover. He gave a ballpark figure of $15 million +ROW and thought it was too expensive. This ThrU turn is expected to cost $ 3-5million. The City just bought 2 retention ponds for almost $3 million. From the same Geniuses who designed the rotaries/Roundabouts on Sargent Rd. ?? IDIOTS! OK I commented before all these crazy folks were elected– YOU HAD to vote– where were you!! This is exactly what happens when local elections are IGNORED__ our newly elected- remaining NUT BALLS are spending money with their FRIENDS– and now we have wonderful BILLBOARDS Lighting our intersections like a FREEWAY. This disaster recommendation of U Turns in front of a High school with tons of kids that walk back and forth to the apartments, townhouses and the Regal and not to mention the Home Games at Johns Creek where overflow parking has people walking across from the Regal Parking. Did anyone forget States Bridge Elementary Students– YEAH that school is there in proximity. Oh and how do our businesses like the IDEA– Wells Fargo, Pannera, Chase, Starbucks, SARA”S, the only gas station BP, Dunkin Donuts, Zaxbys, Publics, Pikes, Whole Foods, Home Depot, and Target and lots of other chain stores and small business partners for Johns Creek??? It will harm their traffic flow and they will need to leave the intersection. Another part of town with abandoned shopping centers on every corner– PRETTY Picture — NOT !!! Simple solution- From Medlock Bridge all the way to Old Alabama Road the lights need to be synchronized for through traffic with variations for M-F peak times and then add extra turn times inbound in the AM and outbound in the PM– Its a simple — effective solution. Then do the same thing the other way and time the lights on States Bridge from Jones Bridge through to the Gwinnett Line. We have traffic flow studies that are current. We do not need to spend 1/2 Million on a proposal and study– Time the lights and plan for Future expansion of 141 from Fulton County line up to the Forsyth Line. This road needs to have fly bridges. Tolls are out of the question we do not want them and will just congest the areas we want to have free flow. The City Council is on a spending spree for no good reason. Have they heard about putting money aside for a rainy day? I have driven in Michigan and find those Michigan U turns extremely annoying and time consuming. I have also driven in Indiana where more and more intersections are becoming round-abouts. These are not necessary. There is no orientation program for people to understand how to navigate around these circles and it is not necessarily a significant improvement over our traditional left turns. After having driven in many parts of the world including UK, the birthplace of round-abouts, I feel our system is perfectly fine. To the City Council members, I have this message: STOP WASTING OUR MONEY on consultants who look after only themselves. These recommendations are unnecessary and will make life even more uncomfortable while driving. If it ain’t broke, don’t fix it. The city of JC has said that overpasses or flyovers at this intersection will necessitate eliminating all the businesses at the 4 corners of this intersection. That is something they don’t want to do. Don’t need flyovers…just need three lanes through in all directions and better light timing…. Any solution that includes U-turns is a mistake. Currently this intersection leads ALL JC intersections for accidents, low-speed rear-end. The intersection currently allows U-turns in all 4 directions! lol – just keeps getting better and better!!! Ridiculous that resident taxpayers will only have a say AFTER the $500,000 is spent on the CONCEPT. This idea should be widely and loudly and openly brought before the residents. I’m sick of this Mayor having his way. Increase time for left-hand turns during peak hours, i.e. 4-6:30 p.m. Fellow Citizens, if you send feedback to the city on the ThruU, could you copy Board@JCCAhome.org ? This will enable an independent, outside organization, the Johns Creek Community Association (JCCA) to also have a record of your input that the city has received. Thanks.